The Glamorous Life of a Housewife: TIMES UP! A Yummy GIVEAWAY. TIMES UP! A Yummy GIVEAWAY. An old lady! My mom put baby powder in my hair to make it white and put it up into a bun. Then she put one of my grandmothers OLD dresses on me and stuffed a pillow in my back so it looked like I was hunched over. She then gave me an old pair of her glasses with the lenses removed and my grandfathers old cane. I wore her pantyhose so they kind of buched at the bottom and clunky black shoes. She put hideously over the top granny makeup on me too. It was the best costume! My friends didn't even recognize me! Do you have a Fall get-together with your family and friends just around the corner and are you panicking over what to bring? Well panic no more!! Enter this fabulous giveaway and I will provide your perfect solution!! 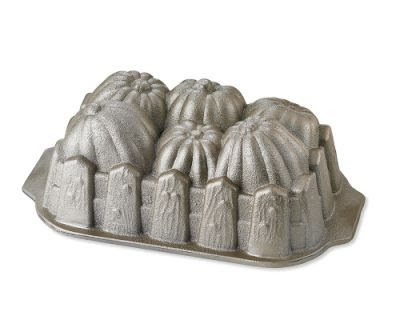 The grand prize is a beautiful bread pan from Williams Sonoma! You will DEFINITELY be the hit of the party if you show up with this delightful dessert in hand. I mean, seriously, it is so cute it makes me want to cry. All you have to do is answer the question below! Remember, if you link me to YOUR blog, you get to enter TWICE! Come on, I know you want this pan. I know you want to be the hit of the party. Don't deny it. Oh my goodness! This is a MUST have! p.s. adding you to my giveaway list! Fred Flinstone. I wore that costume for 5 years and I would have worn it longer but the only thing that fit after that long was the sweaty plastic face mask with the elastic band that pinched my hair in the back. I'm a girl...so Fred was a strange choice, but it got me so much Halloween candy and comments as to being the only boy with all those sisters that I milked that piece of flammable fabric for all it was worth until I couldn't get it on anymore. It was with much regret that I had to retire that costume. My aunt sewed a big, padded E.T. costume for me to wear when I was 6 or 7. It covered me completely and was really heavy to walk in, but no one had a costume like mine! This pan is so cute!! My favorite costume growing up was my strawberry shortcake costume I think I wore it two years in a row because I loved it so much!! My favorite costume? Let's see; had to be the year my Mom made me a big flower out of poster board and then I wore all green to be the stem and she even made me a bee to put on my nose! 1st prize at the costume contest! My favorite costume was a gypsy girl. I wore fabric from my mom's sewing stuff. It was all wild with 70's print. Great stuff. And my mom put Makeup on me. Loved it! My favorite costume was when I was 6 years old. I was a witch; which I know is not very orginal. The great thing about the costume was that my 4 year old little brother was my black cat and he had to listen to everything that I said. If you couldn't guess... I was slightly bossy as a child. My favorite costume was probably when I went as Cleopatra...lots of eye makeup and a black wig. Good times. It is finally fall here in NoVa, so that pan would be great to have around! I think one of my favorite costumes to look back on (and laugh at myself) is from the year I dressed as a blue crayon. I wore a blue sweatsuit, on which my Mom sewed the word "Crayon" exactly the way it would look on a real crayon, painted my face blue, and had a cone shaped hat made of blue construction paper. I think I was seven or eight, but I'm not sure. I was a witch. But not just ANY witch. I had this awesome mask that was like a 2nd skin! Big nose, wart and all! I couldn't participate in bobbing for apples or drink from a cup w/o a straw! It was sooooo cool. BTW, you are already linked on my Blog! ;-) I always host Thanksgiving dinner at my house, so that pan would be just PERFECT!!!! Love the pan!! My favorite costume was tinkerbell. It was the first one I got to pick on my own. Cute pan giveaway!!! I hope I win! I was a princess. I remember the costume being one that tied at the neck and recall the plastic princess mask being hard to breath in and making my face wet from sweat, but it didn't stop me from loving it. I was extremely shy so I felt I could hide behind the mask and be the princess I wanted to be. I was probably 8 years old. How nice! When I was in 2nd grade I was Aunt Jemima from the pancake box. I know you'll appreciate this...I don't ever remember having a store bought costume--my mom and I always made them. And let me remind you that I was an only child growing up so I was sort of a little weirdo. To the point--my favorite costume was Granny! LOL! That was my costume--to be a granny! I told you I was weird. Anyway, I wore a shaw, an old-lady dress, wire rim glasses and I had a cane. And I talked like an old lady the whole time. P.S. 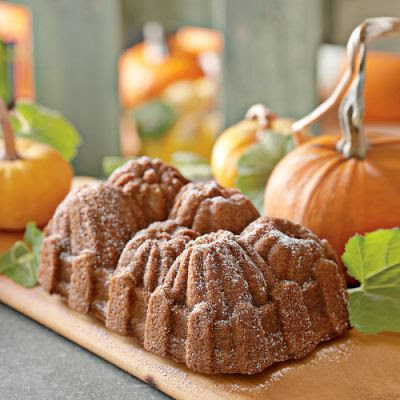 I'm going by Williams-Sonoma today to pick up those fall leaves piecrust cutters that are in the new catalog! So adorable. That is too cute! I love it! My fave cotume growing up was my Southern Belle costume. No one knew who I was supposed to be but I loved the big, beautiful dress! I grew up in a very strict religious family and we were not allowed to dress up for Halloween but when I was eight years old my sister and I put on dresses that we had from a wedding we were in and pretended that we were princesses and ran next door to trick or treat then ran back home and changed our clothes! :) I guess that would have to be my favorite Halloween costume. Than pan is too cute! Growing up my favorite would have to be a french maid costume. But my all time favorite would be a renaissance dress I made for halloween 1997. I won first place for Best Halloween costume. My favorite Halloween costume was probably when my friend and I dressed up as punk rockers. Very 80's! My favorite costume as a child was my "Black Eyed Pea" costume. (this was before this got popular). I wore a black sweat shirt and sweatpants and we put a big "P" on the shirt. And painted one of my eyes black. :) Loved it and so simple! My fav costume was a ballerina! I love that Pan! My mom in law loves to make pumpkin chocolate chip bread and this would be perfect. Anyway, my favorite costume was when I was a Halloween Cheerleader. It was orange and black and I just loved it. My mom made me pom poms and she cut my hair, though she got it uneven, so I really remember my pictures that year! My favorite costume was when my best friend and I dressed up as little old ladies in the 6th grade. We spray painted our hair gray (hair spray paint, that is!) and put it in buns and then wore some of my mom's old dresses. We also found some old glasses. We thought we were so cute! I was Strawberry Shortcake one year when I was little. The plastic face mask is actually a little scary looking in pictures I have. It's so funny to see that stuff come back around after 25 years. Love the pan! When I was 6 and my sister was 6 months old, I was a witch and she was a black cat. I got to carry her around, or at least attempt to, and I was SO proud! We were pretty stinkin' cute! My favorite must be the year I dressed up as a Barbie Cheerleader! My mom made me a princess costume as a kid and I loved it. My favorite costume was when I dressed up as Cindy Lou Hoo from the grinch I put a water bottle on my head and pulled my hair up around it to have her hair style! I am linking to your giveaway on my blog as well! my favorite costume was when my mom made me a carton of mcdonalds french fries...she did it without spending any money and it was fabulous! A pirate when I was a teenager. It had been my sister's costume and had a really short skirt, so I learned that Halloween was the only time my parents would let me out of the house wearing a skirt that short! How darling! I've got to have that for my wine tasting parties, we have to bring an appetizer or dessert, that would be perfecto! My favorite costume was when I dressed up like a Cactus! Yep, I had a green long sleeved jump suit thingy but without legs. It just tapered at the bottom with an elastic at the end around my ankles. It had little cactus thorns (Which were yarn tied into the jump suit like a tied quilt) and it had a head peice with a pink cactus flower on top! Of course I painted my face green too. It was too fun, I miss dressing up for Halloween! I was Casper the friendly ghost. I even had the cool plastic mask with the thin rubber band to hold it on. Ah...those were the good days. SO CUTE!! I must have it! I am catching up on your posts and have to offer up a big congrats! A baby :) How exciting. I can't wait to share it all with you on here. Congrats! great giveaway! i LOVE WS :) my favorite costume when i was growing up was when i dressed up as a pizza. i think i liked it the best because i made it from scratch all by myself, using cardboard, constuction paper cutout toppings and a 2 liter coke on my head! I got so excited about the giveaway that I forgot to answer the question. I had the best halloween costume when I was 5. I was Rainbow Brite! It was adorable! My mom even painted a blue star on my little cheek. I should make her scan it into the computer to share--I was that cute! :) Oh, I linked to you on my blog. Hello! I'm a recent follower of your blog. I love this giveaway! Just saw it in the store and fell in love. My fave costume was when my mom made me a pirate costume. She was/is so creative and she put some sort of sticky solution on my face and rubbed coffee grounds around my chin and upper lip to look like I had a mustache! It had people talking and it got me a lot of candy. When I was growing up my parents never took my sister and I trick or treating so costumes were foreign to us. When I had kids of my own I knew there was nothing more than to take them trick or treating and let them enjoy what other kids were enjoying on that last day of October ... CANDY! The costume I remember most was worn by my oldest daughter when she was three years old. She was ALF. I believe about 90 percent of the kids her age dressed as ALF that year. It was the most popular costume in this area. That is adorable! If I had a blog, I would add you to it, but I don't! On to the question at hand . . . this is terrible, but I can only remember (1) costume growing up and that was a princess and it was just ok. BUT my sister dressed as baby New Year that same year and she was adorable! So I liked her outfit the best :-) Sad, but true. I love the pan, I can see this being shared at my thanksgiving dinner this year! I was a ballerina when I was 4 and I loved it!! My granny made my sister and me a Crayon costume when we were little - I mean we looked like real life crayons. I was a frog and my husband was a fairy princess. I wore a sweatsuit, swim flippers and goggles...all bright green.I ironed letters on the front of the sweatshirt that said "KISS ME!" and walked around with my fingers crossed for luck and my lips puckered for the kiss that would make me a prince. My husband wore an old bridesmaid dress that wouldn't zip all the way up with a tiara and fingerless gloves( had to cut the tips off to get them on). He had a blast flashing everyone his Calvin Klein briefs (it was the year of the Marky Mark billboard on TImes Square). Everyone loved it, except the bride who had originally picked that dress out for me and 3 others to wear in her wedding a year earlier. When I was 7 I went as a picnic and it was seriously the best costume ever! My dad made a wooden frame out of lightweight balsa wood and then my mom and I attached a red and white checkered tablecloth. We hot glued fake food all over it (along with a cute little trail of marching ants!) My mom made a cute headpiece out of a basket and I was all set! My favorite costume would have to be Wonder Woman. We weren't allowed to dress up for Halloween, but one year my mom let me dress up for a costume day at school and I was a bee, and loved it! It was stinking cold outside, so I got to go as a coat. Awesome. One year my Mom made me a Ragadey Ann Costume. I loved it so much. I even slept in it that night.. This is the cutest pan I have ever seen.. Love It. Oh yeah, I forgot. I linked this contest on my blog today.. I was a belly dancer when I was 5. It was classy. My fav is a simple bunny costume. i loved being a bunny and it was cute! A gyspy. My sisters and I were gyspies for years. Love the pan. My favorite costume was a Ragedy Ann costume my grandma made me. She made a wig out of a mop that went with it. It was soooo cute, I remember it like it was yesterday. The only costume I remember picking out was a devil costume that I wore 2 years in a row (my decision). I think I only liked it because the ears glowed in the dark. My mom always had me and my brothers dress alike for halloween. So they were cowboys and I was a cowgirl. They were vampires and I was a vampiress. It went on for years. and my favorite costume - a gypsy - I got to wear shiny scarves, jewelry and makeup! I think my favorite was being a cat (or at least, I did that costume frequently throughout the years). I'm writing about this on my blog this afternoon. That pan is beyond adorable. I fell for it a few weeks ago at W-S.
My favorite Halloween costume? Punky Brewster. It was just fun! I have you linked to my blog too! My favorite costume was when I dressed up as a punk rocker when I was 10 or 11. I wore black leather pants, boots, and a t-shirt with holes in it. Through the holes you could see a black fish net top. I wore my hair spiked and colored red. That was fun. Ok I just linked to your giveaway. I was an Indian princess...loved to pretend that I lived back in the day in a teepee..
For some reason I'm having trouble remembering very many costumes! But, I do remember wearing a clown costume with a painted face and a rainbow wig. I remember going out that year with my two brothers, one a dracula and one a bloodied up, black-eyed football player. That pan is so cute! I linked you to my blog, Whit! Well, I wish I could tell you I had a favorite halloween costume from when I was young but I don't. Being a farm girl, we went around to the neighbors and collected treats - no costumes were needed for that - or else we stayed home and handed out the treats because the parents didn't want to drive us around. Sorry!!! My absolute favorite costume when I was a kid was my princess costume. It was pink and yellow and lots and lots of lace and frills... AND I got to wear a crown and carry a septor! I was very glamorous and wanted to wear it all of the time. At 5 years of age I was a jack-in-the-box...Dressed like a clown with a large wrapping paper wrapped brown box. Super cute, but I remember the box being SOOOO heavy that my dad ended up carrying it most of the way! Anyway, my favorite costume ever was an Oreo cookie. I was like seven I think, and my mom made me this huge Oreo to wear. The design was on the front and the back, and had the white stuffing, where my arms and legs and head came out. This was one of those costumes only little kids can wear, as I couldn't stand, sit, bend, or move my arms in any direction besides straight out away from body. I won a couple prizes because of that costume... although looking back, it's all about my mom's artistic and creative genius. I just posted a link to this giveaway, so I get another entry! Yea! A space girl! I thought a girl of the future would wear a purple-gold shiny shirt (my mom made it). But my favorite part was I put my hair in 20 or so "loops" (ponytail looped back into the band) and wrapped the extra material around each loop. I looked ridiculous, but thought I was awesome! I am trying to think back to my favorite costume growing up. Well, I know I was a hobo and a gyspy more than once but I don't think it was because it was my favorite. It was probably because that was what we could afford. There were five of us to dress up for Halloween so I am surprised we didn't just go as each other! I am old enough to remember when the kids were just sent out to trick or treat on their own-no parents needed. Sad that the innocence of life is gone. Oh, I linked to your site on mine. Enter me twice snookums. Snow White...but that was a few years ago. One of my all time favorite costumes in my childhood was being a Punk Rocker...I got to spray my hair pink and I got to use glittery make-up...what more could a 10 year old want? When I was 8 I was a cowgirl punk. I had a blue cowgirl hat w/feathers and pink sunglasses that were really thin, just covered your eyes, like from Star Trek. I thought I was cool. Oh the halloween memories....If I find the picture I will have to post it to my blog, our costumes where homemade by our parents and I was a bumb/clown one year. My mom made a wig for me out of newpaper...looking back it was so cute, I even had a jump rope tied around my waist to hold up my pants! Too funny! Please do enter me in your giveaway that pan looks like a lot of fun! I've linked you in my giveway list! My favorite was when I was about 5 or 6 my mom made me a Raggedy Ann Doll outfit. I was so darned cute in it! She bought (or maybe made, I don't really know) a red yarn wig, then she sewed a little dress with bloomers. I was cute in that thing! I love the pictures of that holiday! My favorite halloween costume was when I went as a Christmas present. I wore a big box wrapped with bright red christmas paper and I had a big bow in my hair. It is still my favorite ever. Ok, ok......my favorite Halloween costume........hmmmmmm, thinking......probably my witch costume that I wore when I was three. My mom still has it and I love looking at it and I can totally remember wearing it. P.S. I'm adding a give away notice to my blog! Since 2 of our 3 daughters commented on your blog, (the pink potporri and andy and kelly) I decided to walk down memory lane as well...PLUS....I LOVE the pan! Okay I don't know hot to link to my blog, because I have xanga, but I REALLY want to enter twice because i have ALWAYS wanted that pan AND i have two costumes and a blog. you know the link to my xanga. lol okay. first of all, one year I was a jack in the box. My mom got this huge box and cut holes for my head and my arms and so my whole body was basically inside the box and it was all decorated and people would come and like shake ( you can't twist it) my arm and it was like yay jack in the box!And then this year..... I am goign to be STATIC CLING!!!! I'm going to pull up one pant leg part of the way, and stick drier sheets and socks and little towels on me, like static clind, and probably put my hair in like a lopsided pony tail. I think that's pretty great. okay those are my two. Definitely when I was a nerd. That is the best homemade costume. Sooo easy and funny too. I would have to say my favorite costume was a gypsy. Lots and lots of costume jewelry and makeup! I don't have a favorite costume, I just remember the wrath of mother when I picked out a costume with a plastic mask with elastic around the back and then didnt' want to wear the great mask! A scarecrow and my mom always knew how to do everything right. I was a biker chick when I was 10 and my little brother was a biker dude. It was so freaking cute. Rainbow Bright's Sprite. Ashley and I both were dressed like them and my mom painted our faces. I just remember thinking I looked so cute. Funny. Oh, this would be so neat to use! My favorite costume when I was a kid was my butterfly outfit! The wings my mom made for me were so large I had to walk through doors sideways. In 5th grade I desperately wanted to be a southern belle, you know, like straight out of Gone with the Wind....My mom ended up making me the dress and I picked out the fabric...I was just way too homely looking to look like a real southern belle. Yes, I must have this pan!! I can't remember any good costumes I had when I was younger--I think I had a deprived childhood :-( I dressed as a duck as an adult, though, and loved that one! A princess costume with everything. Would love to win! My family didn't trick-or-treat, but I did dress up one year for the Halloween party at school. I was the Cat in the Hat. And a very cute one, I might add! I was a bird, I cut out a big oval out of poster board and glued small squares of tissue paper to it to make the feathers, I had a card board beak. I love making my girls costumes it is fun. My favorite costume was, of course, Madonna! Man, I miss those days! so for Halloween one year I was probably 10 or 11 I talked her into letting me be a witch and wear my hear down long. The minute it was brushed out from those nasty ponytail holders, I bent over from the waist then threw back my head of hair...it felt so good!!!!! ps you have to enter my contest! I'm adding loads of sweetness to it! my dad made the most creative halloween costumes for us. i have to laugh because one year i was mother goose and my brother was an evergreen tree with real tree limbs..haha! I enjoyed being a witch. I loved painting my face green and having my dad make my nose huge. I'm probably too late, but it's early in the morning still! It's gorgeous! Nooooo I missed it?!! What a great giveaway :) Congrats to the winner! Hope you're feeling great! When I was in the first grade, my mom made me the cutest pilgrim girl costume. I picked the color, so it was bright purple! Ohh! A second chance? Count me in! I forgot to mention that my favorite costume as a was a pirate girl (before pirates were so popular...) I had an eye patch and everything.